Medical Evaluation - It is recommended that a medical evaluation is done to identify any possible medical conditions that may be interfering with the hearing screening results. The medical evaluation may include a medical history, physical examination, laboratory testing or consultation with other doctors. Cytomegalovirus (CMV) - a virus from the same family as herpes. There is no immunization against CMV. It is spread in the air and in droplet form. Toxoplasmosis - an infection found in people, cats, birds and other animals. Most people with toxoplasmosis have no symptoms. To prevent exposure, pregnant women should avoid cat litter or dirt and should not eat uncooked meat. Delayed-onset hearing loss is when a child passes their newborn hearing screening as an infant but develops hearing loss by the age of 3. 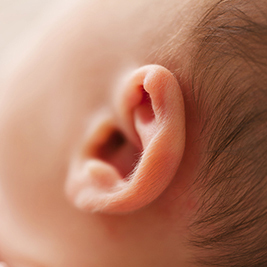 Delayed-onset hearing loss can happen at any time to a child who was born with a risk factor like those listed above.